Blood Pressure is one of the most common lifestyle diseases found in men and women today. 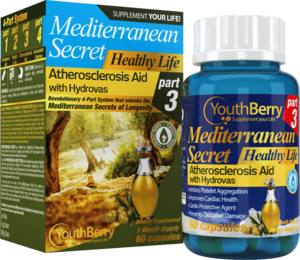 YouthBerry’s BP Management supplements combine potent natural nutritional herbs and extracts that help regularize the systolic and the diastolic pressure to maintain a healthy a blood pressure. Blood pressure is one of the most common lifestyle diseases. YouthBerry’s Blood Pressure Optimizer is the life extension you require. With Holy Basil, Cinnamon and Ultragen Omega complex along with our proprietary Garlic blend, the Blood Pressure Optimizer maintains a healthy blood pressure level, promotes vascular flexibility and elasticity and modulates important metabolic functions. 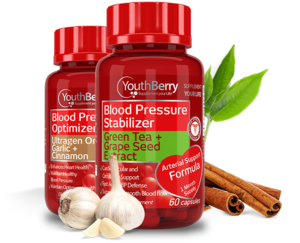 YouthBerry’s Blood Pressure Stabilizer is a potent formulation with Grape Seed & Green Tea extracts. The potent antioxidant properties of grape seed – even more effective than those of vitamin E and vitamin C – help prevent the formulation of unhealthful plaque in arteries. In addition, grape seed extract improves capillary resistance, promotes relaxation of the circulatory system, and bonds with collagen to create more flexibility and elasticity in blood vessels and capillaries. And when Grape Seed extract is combined with Green Tea you’ll have healthy arteries in, no time!